Some issues have been discovered in Family Tree Maker 2014, and their programmers have been working on fixes which are included in this patch update. Covering general bug fixes, and also TreeSync, this is an update that everyone with FTM 2014 should do. Although updates to Family Tree Maker 2014 usually install automatically, some users may need to manually update Family Tree Maker to the latest update, which is version 22.0.0.260 for the 32-bit patch and version 22.0.0.1260 for the 64-bit patch. Click here for step-by-step screenshots for auto updating. But if it doesn’t auto-install, below are the details for manually updating. If you do not receive an update notification and you are not running version number 22.0.0.260 or 22.0.0.1260, you will need to install the latest update. Confirm what version of Family Tree Maker you are running by clicking on “Help” and then selecting “About Family Tree Maker”. 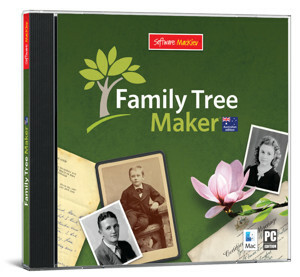 A window will come up that lists which version of Family Tree Maker you are currently running, similar to the one pictured here. Note: If you are using Windows Vista, Windows 7 or Windows 8 you may need to open the file as an administrator. To do this, please right click on the .exe file mentioned in step 4. A drop down menu will be displayed. Please select Run as Administrator. Note: When installing the executable patch, you may be asked to locate the file to patch. You can select either the Family Tree Maker shortcut located on the desktop or the ftm.exe file which should be located in the C:\Program Files\Family Tree Maker 2014 folder. open up since the Patch Update……the program will not open. Ken I’ve now sent you an email directly. Hi Kim, as this is a technical issue, you will need to get in touch with Ancestry customer service directly. You can find contact details for them here: https://www.gouldgenealogy.com/2014/12/how-do-i-contact-ancestry/. Patch failed to install, said I need to use administrator option. I have done that, but program now fails to launch. Audrey, you would need to contact Ancestry’s tech support, and tell them exactly as what stage it’s not working, and if you are getting any error message. They can talk you through it. I need an update for windows 10 compatible with FTM. It won’t open and it asks for a key code??? I tried to download the required patch. I have windows 10. The patch failed to work, as FTM will not open. This just happens as Ancestry drops FTM. I am having difficulty using Family Tree Maker 2014 since Ancestry and FTM parted ways. I am unable to go on line to do any research from FTM 2014. I can go on line @ Ancestry.com but I still like FTM, in my opinion, it is more user friendly. I really wish you could create a way for me to go on-line to look up like it was with Ancestry. is there another program that I can sign up with that will be compatible with Family Tree Maker 14??? family tree maker 2014 will not sync. Now it will not open saying it was not shut down properly. says to compact file but cannot open it to do this. my friend helped me research my tree as I AM NOT that SAVVY. On her Mac Air, she emailed me the program when we finished, but I am unable to download it (or even enter it). I am told that I need FTM 2014 on my Windows, but where do I look for it. I would happily install it, only they inform me that there is some error. How do I install FTM2014, or would it help if I went out and bought a Mac just so I can use my tree? 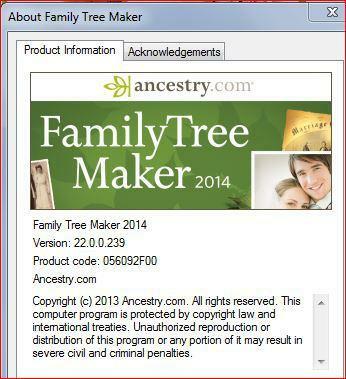 I have Family Tree Maker version 2014.1 and run it on Windows 10. Recently it stopped going “online”. Whenever I try to go online, I get a message telling me I am not connected to the internet. I know I am. What is the issue? Can log on says not online and also can not download the update as it can not read the page from a Google or Bing search. Copied link and tried in another new page and it says it’s working on new features I’ve asked for and the servers are down. Found info of free update which turns out to be more bologna than anything. So, what’s a good genealogy program? Tired of wasting my time. Had I known I couldn’t use it on Windows 10 I wouldn’t have ordered the DNA kit. I have FTM 2014 edition and have for several years. Am trying to reinstall due to having to reinstall from default my C drive. I am having problems with the program saying “cannot install due to not being on the internet”, when I AM on the internet. I also had installed the upgrade of 2014.1, but now cannot locate to install. Phyllis, Sorry but you’ll more than likely need to get in touch with Mackiev (new owners of FTM) to get your installation problems sorted. But you can always check the long list of FAQs first (https://support.mackiev.com/856847-Family-Tree-Maker-2017-FAQ). But if you don’t find your answer go to support.familytreemaker.com, type “Live Chat” in the search box, and start a live chat with MacKiev’s Tech Team.